Sometimes as I’ve already said, hope seems lost, even with all that I have. Just because I have faith doesn’t mean I don’t feel fearful and vulnerable. This post feels a little uncomfortable to share not just because it’s the second anniversary of Abi’s death but because I know many people can’t even bear to consider what hope there is, following their own losses. I’m certainly not suggesting that anyone living with grief should feel the way I do, or that having hope makes it all better. I’m just sharing something that brings me comfort. Some of us will end our lives in unimaginable pain and suffering, leaving loved ones behind to pick up the pieces of grief, their own lives changed forever. Some of us will live long, healthy lives but experience multiple losses. Children lose parents, parents lose children. The closest bonds broken. No matter what we do or believe, we will all experience not just death but loss. To read of hope in loss might be confusing and smacks of brushing off the sheer devastation of grief. Though while I talk of hope, I feel anger in equal measure. I question why our good God allows us to suffer, and battle with feelings of despair… While my mind moves from one thought to the next, my faith is tested, but in God is my cornerstone. It’s not religion, tradition, custom or ritual, it’s the simple belief that Jesus was God’s son, that He came and showed us hope, that He tore down the curtain between us and Him, and His message was love eternal. I may not be a theologian, a ‘good’ Christian or particularly clever with words, but sometimes a phrase or hymn says it all. I walk into church, having been away for a few weeks, my emotions stripped bare, and the first hymn we sing is this one – Cornerstone – I had been feeling how my life, my sanity has been stripped down to nothing more than hope, which isn’t a very positive feeling, but to hear these words almost brought me to my knees. No matter my physical and emotional pain, this is my truth. 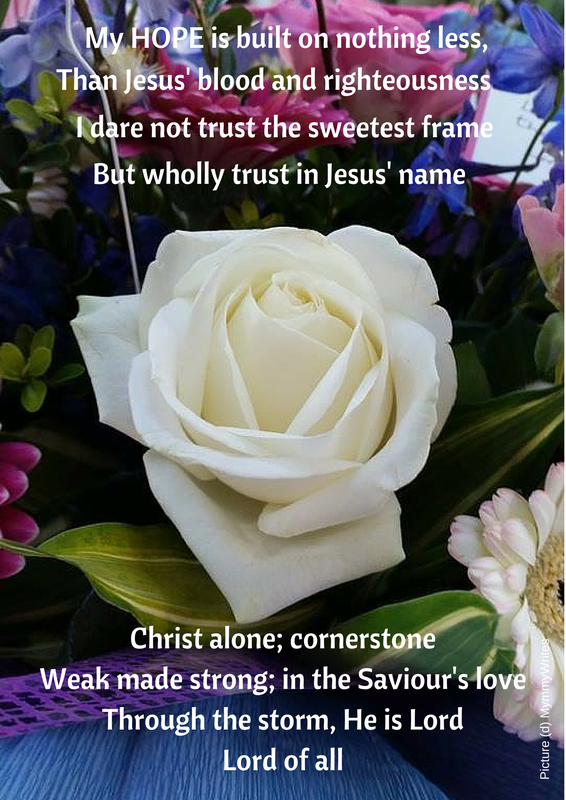 The hymn Cornerstone is here, along with a useful explanation. This entry was posted in Faith and tagged childloss, christianity, faith, grief, hope by Chasing Dragonflies. Bookmark the permalink.